In the past 20 years, China’s capital has gone from sedate to supercharged as multinational conglomerates, high-tech highfliers, and globe-trotting entrepreneurs seek to crack open the world’s biggest consumer market. Thanks to newly relaxed government regulations, they’ve set up and made the former cultural cynosure a regular stop on the Asian economic circuit. With the 2008 Summer Games just over a year away, construction sites are sprouting on nearly every street corner, and real estate prices are rocketing. The glitzy high-rises that crowd the Central Business District, known as the CBD, are home to offices, embassies, deluxe apartment buildings, and the top hotels. The St. Regis’s butler service, including the new luggage butler who will pack your bags, attracts heads of state—President George W. Bush has checked in twice—and chairmen such as DaimlerChrysler’s Dieter Zetsche. 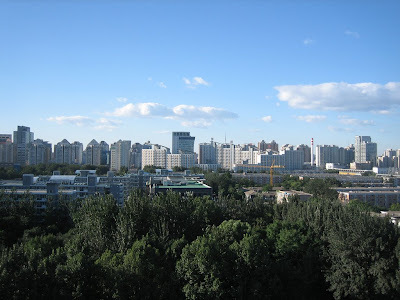 Whiz kids from Motorola, Hewlett-Packard, DuPont, and IBM head to China World, which is closer to the city’s main thoroughfare, Chang’an Avenue. Owned by Hong Kong mogul Li Ka-Shing, the opulent Grand Hyatt is a favorite with his fellow tycoons, as well as the American consultancy Ernst & Young. Sleek and discreet, The Peninsula has free Wi-Fi for its media and Hollywood clients. Slightly to the west and bordering the Back Lake district, the charming and old-fashioned Lu Song Yuan, a traditional courtyard hotel, remains beloved by editors from French Elle Decor and the owners of the gallery Chinese Contemporary. New hotels are popping up in Jingrong Jie, or Financial Street, the city’s Wall Street: The shiny Ritz-Carlton Financial Street has already hosted U.S. secretary of state Condoleezza Rice; Citigroup and Goldman Sachs execs prefer the InterContinental Financial Street. It would be insulting not to try the city’s eponymous dish. Peking duck joints abound, but bankers and consultants in the know entertain their Chinese counterparts at the Nanxincang branch of Da Dong Roast Duck, whose 22 private rooms insure against prying eyes and ears. Impress local clients with some insider intel by booking a table at South Beauty, in the Oriental Plaza, a favorite with local yuppies, where modern riffs on traditional Szechuan dishes—mashed potatoes with spicy Szechuan pickles—are served to diners in white faux-fur booths. If wielding chopsticks tires your poor little fingers, twirl artisanal pasta at Cepe, in the Ritz-Carlton—U.S. envoy Christopher Hill recently treated North Korean diplomats to a taste of Italia here. Expats, journos, and young venture capitalists prefer the breezy atmosphere of Alameda and its eclectic Brazilian-European-fusion prix fixe. Hatsune’s fresh Japanese fare is so popular among Motorola employees that the menu lists a sushi roll named after the company. Long lunches of delicate dumplings and sublime noodles at Din Tai Fung, a Taipei import, sate Asian pop stars and Hong Kong/Taiwan investors. In the heart of the CBD, the sleek lounge Centro continues its reign as cocktail king: Young diplomats, consultants, and bankers mingle with established telecom and investment-banking executives. Financial movers and shakers mix with Beijing’s beautiful people at the new Lan Club, spread over 64,000 square feet. Its neo-Baroque Philippe Starck decor trumps the uneven contemporary Chinese menu. Tucked down a narrow hutong alley in a traditional courtyard house is Bed Bar, where an upscale clientele sip sangria and recline on traditional kang beds. Bankers prefer to unwind with Thai food and draft beer in the Asian antique-strewn interior of Face. The China Club is housed in a beautifully restored, sprawling courtyard structure dating from the Qing dynasty. Nonmembers can dine in imperial-style luxury at the Szechuan restaurant. The American Club, in the heart of the CBD on the twenty-eighth floor of the China Resources Building, offers spectacular views of Tian’anmen Square and the embassy district. It is strictly members-only—angle for an invitation—with white linen tablecloths, wood paneling, an American grill, and a clubby cigar lounge. Brush shoulders with the American ambassador to China, Clark T. Randt, and members of the American Chamber of Commerce, like Google exec Dan Brody. In Beijing, there is no better way to cement a business connection than by warbling karaoke. Book a private room at Partyworld, which offers a long list of American hits. From the moment you hand over your business card with two hands, maintaining mianzi, or face—both your own and your counterpart’s—will be the key to your business relationship. In the simplest terms, face means having the respect of your peers and colleagues. Causing someone to lose face by criticizing him in public or teasing him, while acceptable in the United States, can be a deal breaker. The Chinese are notoriously frank. Don’t be surprised if someone asks your age or how much money you make; these are not considered inappropriate questions. Meeting your Chinese counterpart for the first time? He or she will inevitably show up with a gift. It’s a good idea to reciprocate, with even the simplest token: food from your city, such as chocolates or cookies, or anything with your corporate logo—hat, shirt, key chain, mug. During small talk, never ask anyone how many kids he has: The country’s one-child policy is still firmly in effect. For food at the underserved airport, avoid the two overpriced Chinese restaurants and seek out the Starbucks. Skip the business-class lounge opposite it, and bring your coffee to the lounge across from gate 11, which offers more comfortable chairs and a better selection of English-language newspapers. Avoid the cabbies who lurk outside the arrival hall, and head outside to the well-marked official taxi queue. Make sure your taxi driver uses the meter; a ride into town should be about RMB 80–100 ($10–$13), including a toll of RMB 10. Take a taxi to the Forbidden City, where you can whip through the 90-minute audio guide given, bizarrely, by former James Bond Roger Moore. Then hop a five-minute cab to Houhai. Climb the venerable Ming-dynasty Drum and Bell Towers for striking views before strolling the charming, twisting hutong lanes, lined with traditional courtyard homes, for an increasingly rare glimpse into old Beijing. Bicycles whiz perilously close to pedestrians; vendors trundle along in three-wheeled carts calling out their wares; small storefronts sell cigarettes or fruit; children play on the streets with their grandparents; little dogs, quite a few of them Pekingese, scamper after their owners—scenes that have been played out for centuries.